Entering the Fifth World: "Namingha Family: Landscape, Form, and Light"
Michael Namingha. 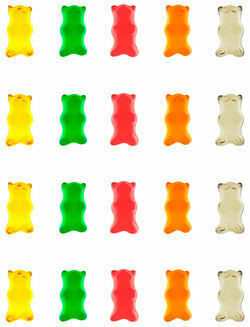 Gummy Bear Wall Paper. According to Hopi legend, Spider Woman created twin beings from clay, a mixture of her saliva and bits of earth. One twin was charged with solidifying the Earth, the other with sending out sound, echoes of the Creator. When these duties were finished, one went south and the other north. Their new job: rotating an Earth finally fit for plants and animals, and eventually, for human inhabitants. Both were charged with keeping order in the world as life appeared. Both were endowed with creative wisdom. Welcome to the Fourth World, the vastly populated, high-tech world we know. According to Hopi prophecy, we're teetering on the brink here. Not a brink — the brink. And the Fifth World sounds pretty scary, depending on one's level of spiritual consciousness and service to the Great Spirit. One of man's first mistakes was turning his back on Spider Woman's creative wisdom and embracing material goods. Material goods won't fare well in the Fifth World. But what has been created with mindful respect and spiritual consciousness commands a different attention altogether. One family's such creations are on display in "Namingha Family: Landscape, Form and Light," through January at the Heard Museum. Namingha's wall-size acrylic on canvas Kachina Symbolism #4 dominates the space (be sure to look at it and the rest of the show again from the mezzanine upstairs). As with most of Namingha's work, the colors — mustard yellow, purple, turquoise, red, black — are rich and bold. Jackson Pollock's influence speaks in the texture of this work. Namingha's carefully placed rectangles — paintings within the painting — are filled with muted uniform half moons. And, as with most of Namingha's work, the figures are abstract. Adolph Gottlieb is another of Namingha's influences, which is clear in this and other work. The symbolism (color is symbolic, too) is loud, while not always clear to all of us. That's okay. Sometimes show signage explains the symbolism, or you might catch bits of a docent's lecture as he narrates for museum-goers. The symbols in this 2002 painting are reminiscent of emoticons — bars, dots, and parentheses that form neat alignments. Even ever-present spirals (Namingha's usually have long tails) form the ubiquitous @. He is speaking to the spirituality of the Hopi culture, clearly. We can't help making our own postmodern, or Fifth World, leaps. Hopi culture is both ancient and postmodern, after all. The nearest painting on an adjacent wall, another large canvas, is Cardinal Directions #17, an abstract breakdown of Hopi color symbolism (yellow = north; red = south; blue = west; white = east). Dan has painted a wide, blood-red frame around smaller frames in the center of the canvas. Each edge of the smaller frames is composed of its according cardinal direction color. Those lines frame what appears to be glowing yellow light at dead center. It all has a looking-down-a-long-hallway effect, and we're pulled into, or drawn to, that glow. Dan's haunting landscapes pack a different punch, even though the colors and lines remain bold and the shapes abstract. Clouds and the shadows they cast are characters, either thick bars of steel gray at the top of the canvas, hovering spacecraft, or playful, even comic, contour lines. Do not miss the installation of works in the mezzanine. Inspired by his own sketchbooks, these are Namingha's most recent works. which represent a departure from the colorful, symbol-packed work downstairs. Here, he says, he breaks down images into their most elemental parts, much as writers break down paragraphs into words. Arlo Namingha, Dan's older son, is a sculptor working in bronze, stone, and wood, and all mediums are represented here. His Sandhills is installed next to Dan's Dualities — both large bronzes — and it's interesting to compare and contrast father's works to son's. 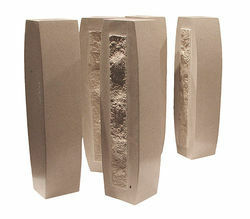 Sandhills is a large sculpture with movable pieces that can stand or lie flat, changeable as landscape in real time. Arlo, too, incorporates Hopi symbolism with a great circle representing the sun and time as it passes. Notches represent cardinal directions and passages in Hopi dwellings. A guide remarked to a tour group that Arlo, dissatisfied with the installation, means for the sculpture to move every day. There it sits, though, clearly and frustratingly off-limits on its platform. Many of Arlo's other works are meant to move, yet they're encased in giant Lucite boxes. It's a shame (although in the museum's defense, an understandable one) that we cannot manipulate the Indiana limestone and Texas shell stone parallelograms and thick books of his "Balance" and "Fifth World" series. Arlo wants to have a dialogue with us or for us to have a dialogue with ourselves. We are supposed to create our own compositions. We are supposed to make choices, then see the consequences of those choices, as we move in the many directions among the many distractions of this Fourth World on the verge. He wants us to play Jenga with his creations and, by extension, with our own lives. Go ahead, pull out a single block, see what happens, his works says. Despite the heavy medium, Arlo's message is subtly suggestive, working away in us like the fossils in his Texas shell stone. See, too, Arlo's recent Spider Woman sculpture, Cultural Images #12, upstairs in the mezzanine. Interchangeable parts represent Spider Woman's twin creations and the hard work they continue to do, one at each pole, rotating our world. His nearby bronze Chanter #1 is at once playful and somber. Look through the chanter's mouth and see the show on the main floor below. More careful placement would have allowed us to see Dan's Kachina Symbolism #4 instead of the show's signage. Talk about symbolism. We want to get our hands on all of Arlo's work, especially the bronze triptych Passing Clouds #2, hanging on the main floor and begging us to explore its nooks, crannies, and crags like a rock climber looking for a perfect hold. Don't touch. But do turn around and look at the wall behind you. Little brother Michael Namingha, who attended Parsons School of Design and divides his time between Santa Fe and New York, is a conceptual artist. His works in this show are ink on paper and inkjet on canvas and seem, on their two-dimensional surfaces, very different from the other work here. Gummy is perhaps a psychedelic take on something cultural — fetishes? kachinas? — or maybe a playful homage to the Grateful Dead and their dancing rainbow bears. Arranged in single-color columns, Michael's gummy bears have a strange translucency and dimensionality. The "clear" bears, especially, are eerie in their cuddly expressionlessness. In another installation, American Dream, Michael comments on a different haunting landscape — the country's bleak economic picture. This suite of 10 square images represents the top bankruptcies in American history. The colors are electric on stark white canvas. The font is cold. Michael uses text as a medium. Though visitors don't have to exit through the gift shop, they can, if they choose to, see some of his edgier, more intimate work in the museum's Berlin Gallery. All three Naminghas are represented in the Berlin; in fact, many of the works in the exhibit are for sale through the gallery. We might think it's the evolution of the work in this show that's so interesting. But we'd be forgetting that the Naminghas are three individuals who share a common cultural heritage but respond to order, balance, direction, form, light, landscape, and the Fifth World on their own terms. We all bring a different spiritual consciousness to the table, but we're all trying to figure out how to negotiate this liminal space Hopi prophecy (most prophecies!) warns us of. Each of us stands in the place where we are; the Naminghas' creative wisdom helps us decide where to turn next.